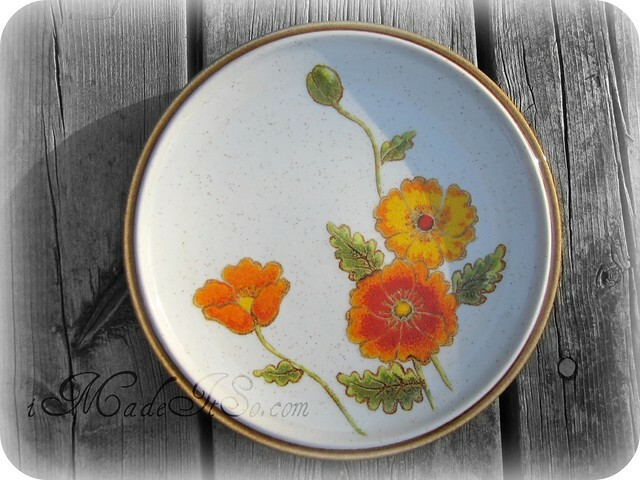 thrift share: mikasa california poppies | i made it so. i will be sharing this post with selena and her readers at apron thrift girl. every monday, you can visit her for other thrifty finds. they were in like-new condition, not a scratch or crack in the glaze whatsoever. when i see something in such good condition, it makes me wonder why it was never used. was it a gift that wasn’t quite the recipient’s taste? was it too fancy for everyday use? or not fancy enough? was it boxed away in a move, forgotten about or passed over for some other pattern? that’s a possibility, the 1980s were looming with their soft pastels and geometric patterns. i can’t help but wonder though. in our home, everything gets its share of use. it will be a miracle, really, if anything survives for future generations. i love the poppy motif, and the colours will work in my orange kitchen. if you’ve been in my home, you know that i’m promptly and entirely dismissing the fact that these dishes will actually be used in my dining room. the dining room is a bright apple green. lalala whatever. i can’t seem to help it. i gravitate to the earthy oranges and browns. too gaudy! hah! some people. go gaudy or go home, i always say. i’m glad that lady went home, without my gaudy dishes. still not sure if we’re right for each other? learn more about me here. 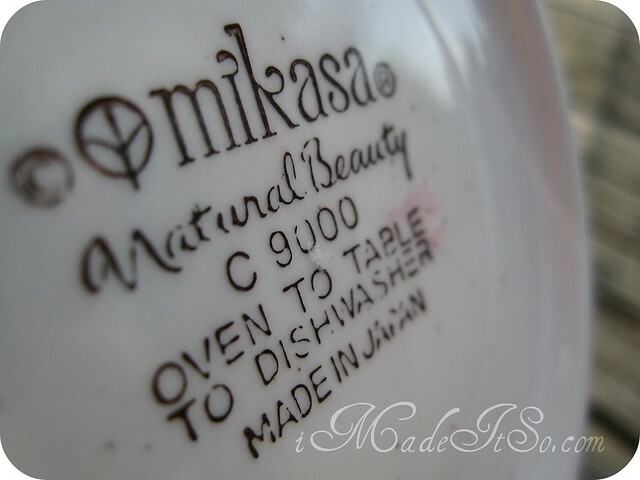 This entry was posted in thrifting & vintage and tagged mikasa 1970s, mikasa california poppies, mikasa dishes, mikasa history dinnerware, mikasa natural beauty, mikasa vintage, thrift store mikasa, vintage find mikasa. Bookmark the permalink. That is such a great find! Thanks so much for visiting my blog. Hope you’ll continue to come along! That is a fun pattern- love the colors! I love the earthy stuff too… Isn’t thrifting the BEST???! Thanks for the Mikasa info- I never knew they used different manufacturers! i didn’t either, til recently! all their stuff has a distinctive look. whoa! deja vu moment! i have eaten off those plates at some point in my life. i’m thinking my mom maybe had them when i was little? *Giggles! * I love your sense of humor so much. I have two of the bowls! Well, I adore those dishes Ana and how special that they came home with you to an appreciative and loving home …who wants plain anyway!!! 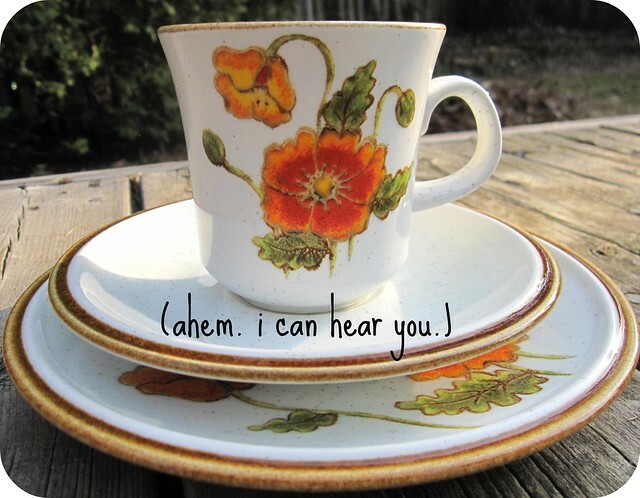 I think your cups and plates are really cheerful – not gaudy in the least. I bet they’ll look fantastic on the dinner table. Interesting… I actually think a plain bowl with a brown rim wouldn’t look very good – I much prefer the cheerful florals! That was too bad that the bowls were separated from the set. Still a great find though. I used to have a bright orange kitchen in my last house. I loved it, and even the doubters who frowned upon my paint choice came to embrace it. However, I painted it a ‘neutral’ colour before putting the house up for sale. i think we’ll likely get similar advice from a realtor. but til then, we’re living in it and i love it. My aunt had those dishes! Though I don’t remember more than the plates. I think we tended to use promo mugs and the bowls without the poppies sound about right. But I love these mugs. I wonder if she never got them, or thought them too fragile for kids or what? it’s so cool hearing how many people here have seen or used these dishes at some point. I’ll keep an eye ball out for more! *almost wetting myself laughing* oh Ana, I so love to read your blog, you are so full of life and happiness. Gosh I can’t believe the other chic just took the bowls. lol. I would have bought the whole set, although I would have thought the bowls a tad boring with no poppies on them, but would have got them anyways. I love poppies and hopefully in about 3-4 years time will have a front garden bursting with poppies each November right in front of our purple tibouchina hedge. My op shopping has taken a back seat while I attempt to focus on getting my studies out of the way *ugg* but I will be back as soon as I can. That is my treat to myself for getting through the studies. lol. yeah, no fancy cruise or diamond necklace for me, just a day at the op shops and I am bliss. Thanks for sharing the love. Have a wonderful evening at your place. Thank you also for stopping by my little blog, I so love your comments, you totally brighten my day. Bless. Actually, my (not at all gaudy) chrome and red velvet dining room set is graced with Mikasa too.